The scholarly monograph - the book-length result of dedicated research - finds itself in a precarious position. As library budgets diminish, and are further squeezed by the increasing costs of journals, there is little left for purchasing monographs. What budget remains is often spent on duplicates of books that are available at other academic libraries. More unusual or important local collections risk being side-lined or undervalued. While the monograph remains a critical part of the scholarly dialogue, especially within the humanities and social sciences, sales are falling and as a result researchers find it increasingly difficult to publish their book-length research. Where journals have tended to dominate discussion of academic print resources, the monograph has been a somewhat neglected part of the scholarly communications debate. But this inattention is giving way to sustained focus by publishers, libraries, researchers, funders and systems vendors exploring the changing role and shape of the monograph and its future as part of the scholarly communications landscape. We have an opportunity to begin collectively addressing some of the core challenges that confront the provision and support of the scholarly monograph; past, present and future. Over the past six months over 60 librarians, academics, funders, publishers and sector bodies have identified the core features of a national infrastructure that will help transform the creation, collection, use and preservation of the scholarly monograph. This roadmap describes a series of practical, doable ideas; ideas that will evolve and respond to changing contexts, user needs and the results of prototypes and pilots. Over the next few months the project will begin to develop plans for these potential pilots and prototypes. But all of this will remain ideas without action: action by us, by you and by anyone who has a stake in, or an interest in, the creation, collection, use and preservation of scholarly monographs. While the project and this report have primarily been aimed at those supporting the monograph’s creation, collection and preservation, such as librarians, publishers and relevant sector bodies, the work will also be of interest to researchers and academics as well as funders, policy makers, systems vendors, institutional managers and anyone with an interest in the past, present and future incarnations of the scholarly monograph. It is only together that we can work to build these ideas and realise the vision of a national research collection that has the potential to transform the experiences and work of researchers and students in the UK. This report marks a beginning, not an end. Within 5 years UK researchers and students will have unparalleled access to a distributed national research collection enabled by an open collaborative national infrastructure. Background to the national monograph strategy project: where it came from, its approach and the people involved. This section outlines the current landscape, aims and objectives of the strategy and the potential benefits, and how the project will seek to implement the ideas. Finally it describes the specific problems that were identified as priority areas for any strategy to address. The national monograph strategy (NMS) is a six month project funded as part of Jisc’s pilot co-design initiative, working with UK higher and further education sector bodies to collaboratively find solutions to the priority problems experienced by people in universities and colleges. Read more about co-design. Running from July 2013 to January 2014, the NMS project worked closely with its partners: the Society of College, National and University Libraries (SCONUL) and Research Libraries UK (RLUK), as well as a broad range of key stakeholders from different sectors. The project aimed to explore the potential for a national approach to the creation, collection, preservation and digitisation of scholarly monographs.1. Outlining solutions to the problems. The project held three workshops which largely mapped to these phases. Each workshop consisted of 20-30 key stakeholders with an interest in the monograph, including librarians, publishers, academics, and representatives of funders and sector bodies. The project’s expert advisory panel 3 formed the core participants at each of the workshops, providing consistency and momentum. The project also benefited from having a close and productive relationship with its co-design partners from the Society of College, National and University Libraries (SCONUL) and Research Libraries UK (RLUK): Ann Rossiter (SCONUL), David Prosser (RLUK) and Wayne Connolly (Newcastle University), who provided critical input and feedback throughout the process. The national monograph strategy has emerged from a rich, complex and rapidly changing scholarly communications landscape in the UK. While it is not the intention of this report to provide a comprehensive overview of that landscape, it is worth reflecting on some of the key changes, developments and trends that have both informed the strategy and will continue to exert an influence over its development and implementation over the coming years. The monograph presents the academic institution with a double-bind. The changing demands on space, especially in libraries, mean that large physical collections need to be rethought to enable the reconfiguration of space to meet the changing demands of students and researchers. But what has worked so elegantly for journals doesn’t necessarily apply to monographs. While users have largely embraced digital access to journal articles (with hardcopy versions used as ‘last copy’ backup) the same isn’t true for the monograph. Research suggests that academics require the hard copy text for long form reading and in-depth research, especially within the humanities and social sciences. While there continues to be an expectation of digital access on the part of users, the requirement for the full-text monograph means the paper version often provides a better experience for the researcher and student. The UK Research Reserve (UKRR) is an exemplar in the development of a national and collaborative approach to the challenge of retaining low-use print journals. The collaboration between academic libraries and the British Library enables its members to de-duplicate print journal holdings if the title is held by three other UKRR members (including a copy at the British Library). This ensures long-term access to journal titles while also allowing libraries to free up precious space and resources. While the challenges of the monograph are different than those associated with the journal, UKRR nonetheless provides a useful model for how a national, strategic approach to the monograph collection might be undertaken. In particular, UKRR has been successful in building a trust fabric between participants. Mechanisms such as formal agreements and the inclusion of the British Library document supply service have been key to developing confidence. As UKRR highlights, the role of the national libraries in any UK-wide approach to the management of monographs will be critical. As the British Library’s new content strategy makes clear, the role of the national library is increasingly moving from a focus on ‘stored knowledge’ to one where ‘smart knowledge’ is paramount5. Libraries will increasingly be linking and connecting to content, which means that local collections will need to be placed within a larger national, and even international, context. Built on the Copac catalogue of around 90 UK research and specialist libraries, the Copac Collection Management Tools (CCM) were developed as part of a partnership between Copac, Jisc, Research libraries UK (RLUK) and the White Rose consortium of academic libraries. Promote the efficient management and exploitation of collections, pursuing excellence in research and safeguarding long-term access to materials. Through collective action the use of the CCM tools will help to realise the community vision to build a national research collection. With the partners, CCM has developed a prototype tool that enables a library to see to what extent their holdings overlap with other Copac institutions. The tool primarily supports libraries in decisions around collections and print stock management, specifically the retention and disposal of print material. Through use by the partner institutions other use cases are emerging, including some around informing purchase decisions and prioritising material and collections for digitisation. While CCM remains primarily a tool for those research institutions that are part of Copac, it has the potential to underpin a national solution for the management of legacy monograph print collections. Developments like those described above are informed by, and help inform wider policy decisions from government and elsewhere. While much of the attention around open access has been focused on journals, there is a growing desire to see national and funding policies that also apply to monographs. Indeed, as open access increasingly plays a role in how research impact is measured and assessed, its implications for the monograph are ever more acute. The relationship between the monograph, open access and research impact is something that UK funders are turning their attention to. The Higher Education Funding Council for England (HEFCE) have recently convened a panel of experts6 to explore the issues surrounding monographs and open access in order to understand the challenges confronting the monograph and open access publishing and how these are likely to inform the role of the monograph in the evolving scholarly lifecycle. With HEFCE’s recent policy announcement stating that journal articles and conference proceedings need to be open access in order to qualify for submission to the next Research Excellence Framework (REF)7 this group’s work will be of critical importance in the coming years. The transition to open access monographs is also being explored by the OAPEN-UK project. The project builds on the Open Access Publishing in European Networks (OAPEN) project and the OAPEN Library, an open access scholarly monograph platform for humanities and social sciences (HSS) titles. Specifically, OAPEN-UK aims to build up an evidence base surrounding the challenges and opportunities of open access monographs so that stakeholders in this space, including policy makers, can make evidence-based decisions. While the relationship between open access and the monograph is currently the key driver for much of the policy work currently taking place, the evolving monograph form is beginning to emerge as a topic of interest to policy makers, funders and stakeholders in this space. While interest in the form of the book has a long history, there have been a number of recent announcements that have signalled policy makers, funders and national bodies are beginning to take a far greater interest in the form of the monograph, and its implications for the future of scholarship and research. In the UK this initial interest is exemplified in the funding of a project to explore the ‘future of the book’ through a partnership between the Arts and Humanities Research Council (AHRC) and the British Library. In the United States the Andrew W. Mellon Foundation have for a number of years been working with universities to understand how digital practices in publishing can be incorporated into humanities scholarship. They have recently announced a programme of work exploring the ways institutions and scholars might be encouraged to explore the potential of digital scholarly monographs. Importantly, what these developments highlight is that policy developers are still struggling to catch up with the major cultural and technological changes that threaten to radically undermine the underpinnings of the scholarly monograph. The web is enabling access to new, low-cost publishing services, tools and infrastructure. The components of the scholarly publishing process have been broken up and made available as discreet web-based services8. While such services remain a relatively small part of the scholarly publishing ecosystem, they are developing their own growing user bases, and highlight the opportunities that are being realised in this space. These opportunities are also being seized by academic institutions themselves. There is a growing interest in the institution as publisher, with universities such as University College London and University of Huddersfield developing local presses. What’s interesting in these examples is that the library has provided a home for the university press, along with expertise and infrastructure. There has also been significant interest in the development of open textbooks by institutions, with an increased willingness to explore community solutions to some of the seemingly intractable problems associated with e-textbooks that institutions, libraries and students face9. These broader changes in the technological landscape have provided institutions and libraries with an opportunity to reconfigure their roles in relation to the creation, curation and consumption of academic outputs and, specifically, the scholarly monograph. While this brief overview of the monographs landscape cannot hope to be complete, the strategy has gathered a number of the key articles and examples that describe the changing monograph landscape in a literature review that can be found on the project’s blog. It is from this context that the national monograph strategy emerged as a project and it is from this starting point that the project worked with various stakeholders to begin sketching out some ideas for addressing the challenges that the scholarly monograph faces. The national monograph roadmap describes the components of a collaborative, national infrastructure that provides answers to the past, present and future challenges of the scholarly monograph. The roadmap aims to be a doable, practical framework to corral action, guide effort and solicit engagement both for individual institutions and for the sector as a whole. Below are some examples of potential benefits for stakeholders of the national strategy approach described on the previous pages. In order to deliver real benefits, however, any roadmap needs to result in real changes. This is why the roadmap doesn’t simply describe a vision, but also a strategy for delivering that vision. How to better manage library collections and acquisitions? The existence of large amounts of still un-catalogued material and incomplete metadata records can make it difficult to determine with certainty a national view of monograph collections. This affects the ability of individual institutions to manage their local collections within a larger national context. Purchasing and processing monographs involves duplication of resource across all institutions. How to allocate preservation resources? There is a need to ensure that preservation resources are allocated strategically to maintain as comprehensive a collection as possible. How to avoid duplication of effort in digitisation? Can we better understand the nature and extent of it? Using these problem statements as a foundation, the final two workshops began to sketch out potential solutions to these specific questions. These outline solutions form the core components of an open, collaborative infrastructure that will underpin the vision of a national research collection. An overview of the infrastructure components and how they come together to realise the vision for a distributed national research collection. As the problems described on the previous pages make clear, the roadmap is responding to a ‘messy’ problem. 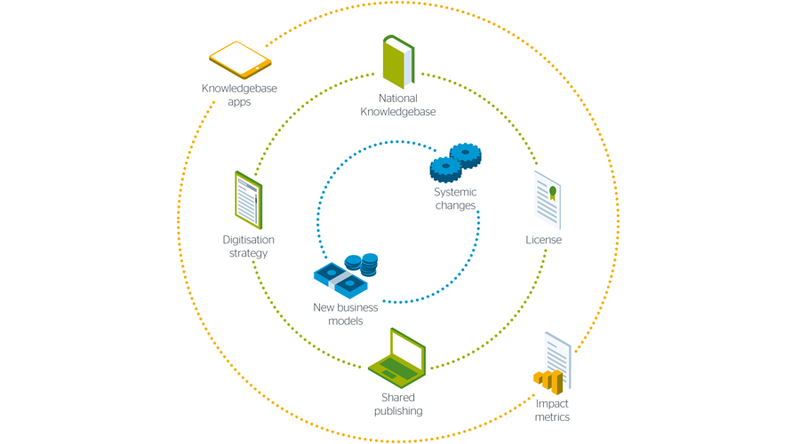 The solution described here seeks to provide a coherent picture of a shared infrastructure that can deliver a distributed national research collection for the UK. As such, the solution includes interventions that move from the policy, foresight and licensing/business model level, through to the main infrastructure components which enable the development of new services and applications. The solution is the culmination of multiple strands of work as illustrated below that together deliver the national monograph strategy. The speculative use case below describes the potential of this infrastructure for the University College London library and its users. The full use case is available on the national monograph strategy blog. Further details on how the project plans to realise its vision, with more detail on how each of the component parts will underpin an open and collaborative monographs infrastructure for UK teaching, learning and research. The ‘roadmap’ describes seven critical components that will make up a national monograph infrastructure. Each description includes key features and what the next steps will be to begin development. These will be led by Jisc with the support of the national monograph strategy project governance and partners. There is also a ‘dashboard’ which includes an overview of the available budget for each idea, an initial calculation of the risks of the idea being unsuccessful, the project timescale for the development of the idea into a working prototype (or draft, proof of concept etc, as appropriate) and budget based on an estimate of people, financial and other resources required. Although not definitive, we have used the brackets high (£60k+), medium (£25-55k) and low (£0-25k) to assist with initial planning. The ideas in this section build on existing thinking and initiatives, bringing them together to form a coherent and holistic infrastructure for the creation, collection, use and preservation of the scholarly monograph. Agile: The ideas described have agility built in. In most cases they will enable new developments, encourage third party collaboration and always have one eye on the future through the governance structure of the work. Given the short timescales for the pilot phase of the project, this roadmap will be complimented by an implementation plan for each of the areas described; this will be developed as part of the project’s next steps through September and October 2014. The foundation for a distributed national monograph collection. An open, comprehensive, accurate and timely bibliographic and holdings knowledgebase. This will form the core of the monographs infrastructure for print and digital monographs by enabling the development of a national collection strategy as well as new services and applications created for, and by, libraries, systems vendors, publishers and users. Following that, work with relevant organisations and projects to explore the scale and potential of replacing proprietary metadata with open surrogates. Identify potential partners to establish the basis for a monograph’s ‘trust infrastructure’ in the UK, and look to pilot with institutions and consortia. Understanding the impact of the scholarly monograph. A service that enables researchers, libraries and publishers to track and manage the impact of their monograph to provide new insights, track influence and inform purchasing. Design a process for rapid prototyping, testing and iteration based on feedback with users. Develop functional requirements for database (including development of APIs to provide data to interfaces) and rapid development of interface prototypes. Enabling experimentation with formats and models. A shared, open publishing platform that enables innovative, low-cost approaches to academic monograph publishing by moving the management and production of monographs online and helping improve their quality and impact. Work with institutional partners, academics and publishers to investigate existing technical prototypes and services, to both learn from and potentially build upon. Testing and piloting new business models for the benefit of research. This project will work to establish the criteria and potential for new monograph publishing business models by building on the experimental objectives of the shared publishing platform to pilot, where appropriate, existing initiatives and experiments around the monograph business model, and by developing and piloting its own innovative models. Building a national digital research collection. A nationally negotiated agreement for digital monographs. A license negotiated by a third party on behalf of the UK academic sector for access to digital scholarly monographs, to improve access for researchers and students and reduce management overheads for publishers and libraries. Providing foresight and insight into the monograph’s future. A high-level, international ‘think tank’ providing a systematic view across the disparate parts of the scholarly communications/monograph landscape. Undertake an environmental scan: What groups already exist? Who’s doing similar things? This is the section with information on how you can get involved or follow what happens next with the project. We need your help. We have worked with over 60 people from publishing, libraries, researchers and academics, sector bodies and funders (both from the UK and US) directly through the project workshops and expert advisory panel. We have also used the project blog to engage a far larger number of people as the project progressed; posting our outputs and asking for feedback and comments. But we realise that our view of the world may be different to yours. To get to this draft strategy took six months. Imagine what we could achieve in another 12 or 18 months. This is just the beginning; the real work is about to begin. This report is the product of a huge amount of work from individuals across the higher and further education sector, including librarians, researchers, funders, publishers and sector bodies. It is a sign of the passion, engagement and effort that the project generated that it is not possible to mention everyone who helped contribute to the project via the workshops, the blog and other mechanisms. But, we were fortunate to have a core team of experts that helped shape, refine and deliver the report and its strategic roadmap. And Richard and Marta from LiveWork for making the workshops so productive and the outputs so useful.